Send your favourite person a unique gift by adding your own personal engraved message. 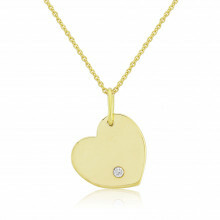 This Gold heart Pendant is a sleek and solid piece with an off centre single Diamond. With its gently curved edges and perfect finish, this is a very tactile Necklace and extremely satisfying to wear. The addition of your individual engraving makes this an exceptional, romantic gift.